Well, it's no secret I'm attracted to shiny and glittery things, so it should also not be a surprise that as soon as I realized the Kuretake ZIG Wink of Stella markers had glitter in them (and had pink available), I acquired one. ... Or two. 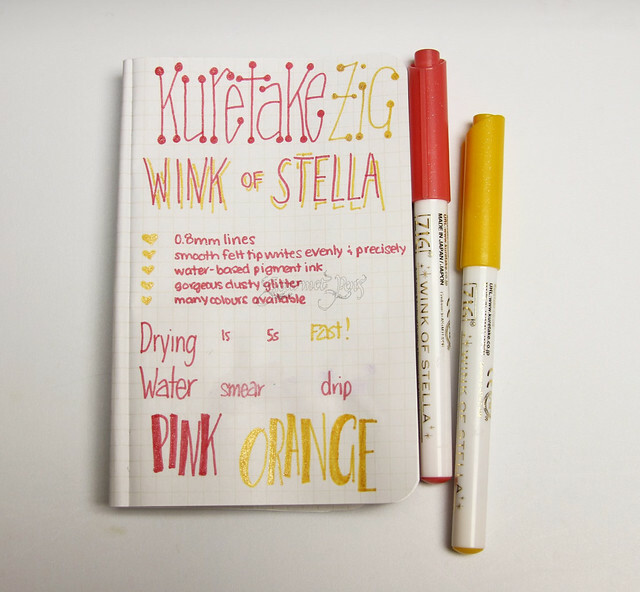 The Kuretake ZIG Wink of Stella glitter markers are quite attractive - they have white bodies with ink colour-matched end plugs and caps. The whole body is plastic. The body has a lot of gold writing on it that is easy to read, fortunately (often an issue with gold writing), and it descries the marker, the tip, and some features of the marker. The tip is a felt tip tinted by the colour of the ink itself. These glitter markers perform exceptionally well. 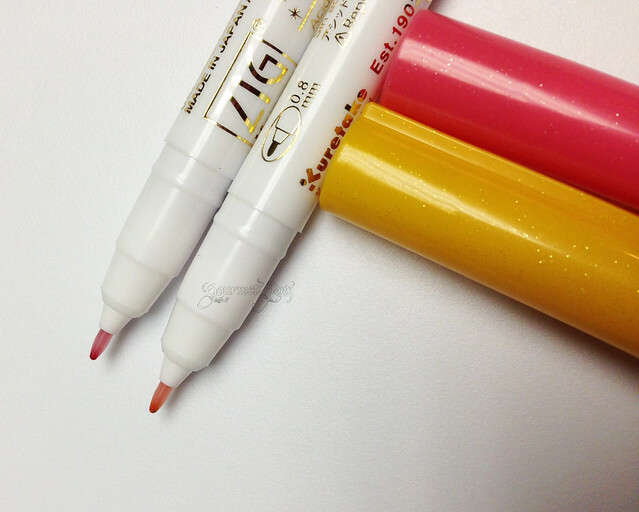 The felt tip is smooth but solid - it does not feel like it's going to break under pressure. It holds up well to writing and drawing. They can write on a variety of surfaces (except for very bumpy surfaces), the glittery ink flows very well. I was really pleased that the glitter did not affect the writing performance as sometimes glitter can cause disruptions in writing. This is not the case here. It is seamless. The ink dries very fast and is quite water resistant. The ink colours themselves are gorgeous - rich colours that are highlighted beautifully by the glitter. Smooth and even writing delivered by felt tip. The glitter is really pretty. Makes the already pretty ink even nicer. It would be great if a finer tip was available. The 0.8mm is great but is quite broad. I adore these markers. They are really pretty, very fun to write with, perform well, and are quite affordable at $2.00USD each. With the range of colours available, it's very tempting to get them all. And I would not discourage you to do so. 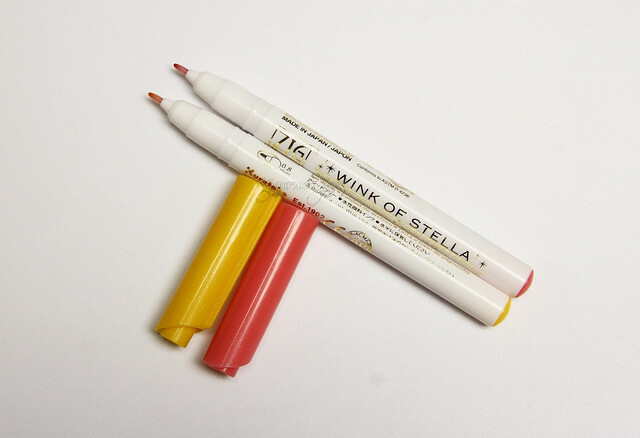 The Wink of Stella brush pens are great too, especially the Clear 'colour'. It allows you to add glitter on a larger surface area really easily, and, as with all brush pens, allows for varying widths of marks, so you can write with them as well. I really like that it's not the conventional glitter, as well. It's more like shimmer.